[toc]A peptic ulcer or stomach ulcer is an ulcer in the lining of your stomach. Peptic ulcers can be caused by poor diet, excessive smoking, alcoholism and even over ingestion of anti-inflammatory medications. Herbal remedies are a good idea for those suffering from peptic ulcers. 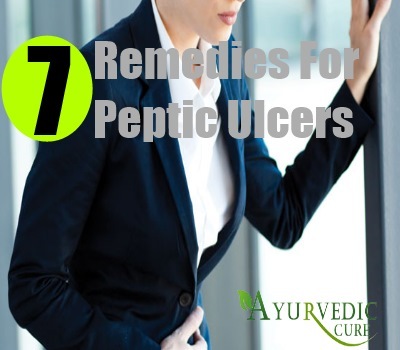 Bilberry, Calendula, Licorice, Chamomile,Yarrow, Slippery Elm, Marshmallow, Peppermint, Ginseng and Aloe Vera have been used to cure stomach ulcers or peptic ulcers through herbal means. Herbal remedies are very effective for this problem and it is also recommended that you consult a qualified medical health care professional before using these remedies along with allopathic medication. This article covers some of the leading herbal remedies for peptic ulcers. 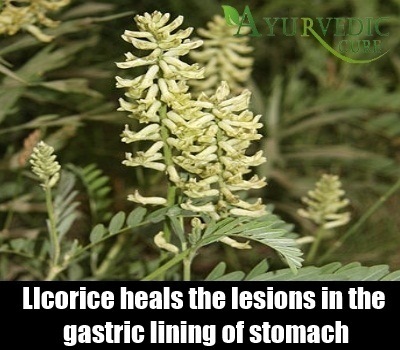 Licorice is a very effective cure for peptic ulcers. It heals the lesions in the gastric lining of your stomach and it is a very fast acting cure for peptic ulcers. This herbal remedy is especially effective for curing peptic ulcers which have been caused by over use of anti-inflammatory medications such as ibuprofen and it helps to reduce the toxicity in the stomach. Licorice can be mixed along with Angelica and the mixture can be consumed for quick, but effective relief from peptic ulcers. 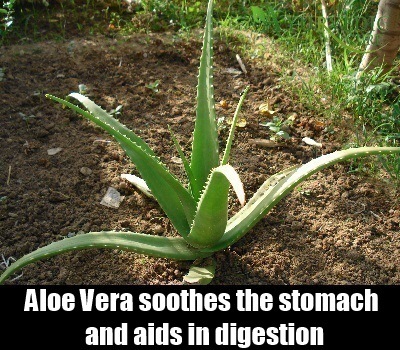 Aloe Vera is a succulent herbaceous plant which soothes the stomach and aids in digestion. It is very effective for gastric problem and it heals the gastrointestinal system. The juice of Aloe Vera can be consumed in moderate amounts for relief from ulcers. Aloe Vera has remarkable healing properties and it is also antibacterial, antifungal, antimicrobial and a soothing tonic for the stomach. Aloe Vera leaves are very beneficial for the stomach and the juice extracted from the leaves can prove to be a remarkable boon for curing peptic ulcers. 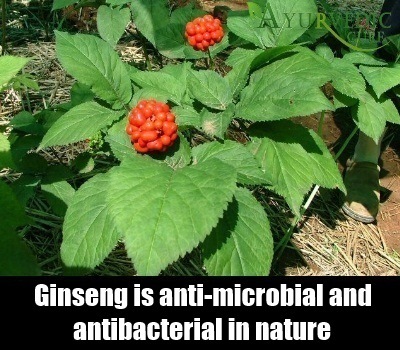 Ginseng also referred to as Panax Ginseng is excellent for curing peptic ulcers which are caused by infections. This is because this herb is anti-microbial and antibacterial in nature. It is very effective in destroying the H. Pylori bacteria which can cause stomach ulcers. Ginseng is also very good for revitalizing the digestive system and it is very efficient in healing the inner lining of the stomach and destroying any infectious bacteria present there which may be causing ulcers in the stomach. Ginseng can be had in the form of an extract for relief from peptic ulcers. It is also readily available in supplement form. Yarrow is a herb which stops bleeding and in case the peptic ulcer is an open sore, this herb can soothe the ulcer and stem the flow of inner bleeding. 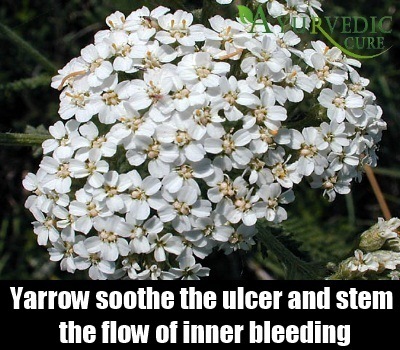 Yarrow also ensures fast blood clotting and this is very important for curing peptic ulcers which are actually lesions in the inner lining of the stomach. This herb also possesses anti-inflammatory properties which makes it an ideal cure for reducing the swelling of the ulcer. Yarrow can be had in the form of herbal tea or tincture. It provides immediate relief as well as long term benefits that help preserve the good health of your stomach and gastrointestinal system. Chamomile is very effective for aiding digestion and curing digestive problems. This magical herb also helps to heal the stomach and cure peptic ulcers. This is because this herb has apigenin, which is a flavanoid that kills H.Pylori bacteria which causes peptic ulcers. 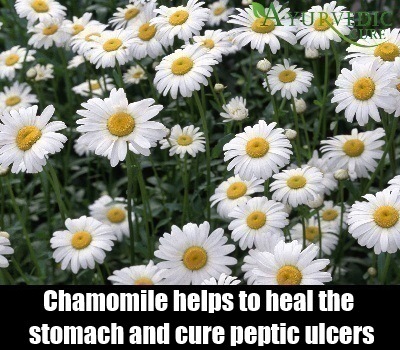 Thus, peptic ulcers caused due to infection can be cured easily by having 2 to 3 cups of soothing Chamomile herbal tea. You can also take this herb in the form of a supplement or extract. Boiling dried leaves of this herb in water, straining the liquid and consuming it is also another effective way to take this herb for curing peptic ulcers. 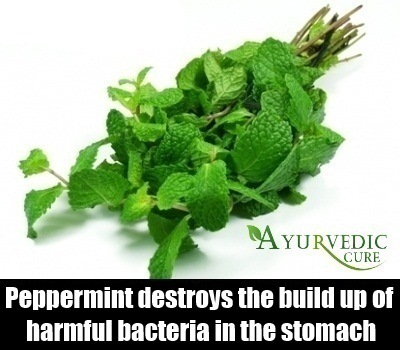 Peppermint is also a very efficient cure for stomach or peptic ulcers. This is because it contains menthol. Menthol is an ingredient which is antibacterial in nature and therefore, it destroys the build up of harmful bacteria in the stomach which causes peptic ulcers. It also reduces acidity in the stomach and cools the stomach. This heals the peptic ulcers which are caused by poor digestion and acidity. You can have refreshing Peppermint tea. You can also take Peppermint drops for curing peptic ulcers. 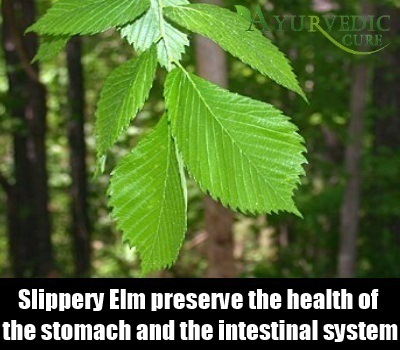 Slippery Elm is a herb which is also a popular cure for peptic ulcers. This is because it has gel which is mucilaginous in nature. This is very good for preserving the health of the stomach and the intestinal system. You can take the powdered leaves of this herb and mix it with lukewarm water. You should stir this concoction for about 12 minutes and then consume this mixture in order to destroy peptic ulcers. Slippery Elm is an effective herbal cure for peptic ulcers because it aids the digestion process and reduces the toxicity in the body.